Alzheimer’s disease affects the mind in many ways, leading to loss of memory, confusion, poor judgment and decision-making skills, among other essential functions. But it also poses great challenges for the friends and family who care for the person, and the progressive condition can elicit feelings of sadness, anger, frustration and fear among the children of these seniors. When it is time to decide if your parent needs more care you can’t provide, children often experience guilt over moving a parent to a nursing home, or an assisted living community such as Aegis Living. This can be detrimental to the health and safety of the parent, so it’s important to deal with these emotions and move through them. When a senior begins to show symptoms of dementia, such as difficulty remembering or confusion, it can easy to dismiss these as simple forgetfulness that comes with getting older. Even after a parent is diagnosed with Alzheimer’s, their children may be afflicted with denial, stuck with the feeling that their mother or father will simply snap out of it. It’s important to recognize one’s own denial before an incident occurs that brings harm to the parent or causes a person with Alzheimer’s to hurt someone else. Driving, for example, can be very dangerous for a person with dementia, as they may have trouble recalling right-of-way rules, become lost in their own neighborhoods or hit a pedestrian in a bout of confusion. Start a journal: Writing about your emotions and experiences can be very therapeutic. Seeing details about your situation displayed on paper can allow you to distance yourself and see things in a new light. Talk it out: Open up to a loved one or trusted friend about the fears you’re feeling. Simply by listening, he or she may be able to help you shed light on underlying causes of your emotions. Sometimes, hearing yourself say something out loud can allow you to better understand the reality of situation. Join a support group: Surrounding yourself with others in your situation can make it easier to cope with denial and move past it. 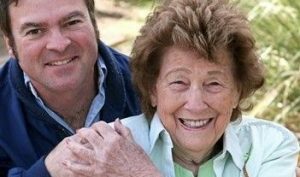 As you hear others’ stories about dealing with a parent with Alzheimer’s, you may begin to let your guard down, accept that your parent has dementia and take steps to improve his or her life. Most family caregivers must make a tough choice at some point – to put a parent in an assisted living community or care for him or her at home. This can muster up intense feelings of guilt for a number of reasons. Children may feel regret for how they treated their parents before diagnosis – before they knew it was dementia causing cognitive dysfunction – or for feeling trapped and resentful after diagnosis. They may feel at fault for wanting more time for themselves, wishing the whole thing was over or not visiting often enough. If you’re used to being responsible for the health and safety of your parent, it can be hard to let go and allow someone else to take over these duties. Remind yourself that placing your parent in the hands of trained and compassionate individuals isn’t a form of giving up, it’s a different way of caring for your parent. You can fight feelings of guilt by contributing to the health and happiness of your parent in different manners, such as by bring the morning newspaper each day, stopping by for dinner or calling to say goodnight each evening. You can also maintain an active role in your parent’s health care by keeping open lines of communication with his or her clinicians. Concern over the level of care a parent will receive can be a major source of guilt, so take some time to really get to know the environment your mother or father will be living in. Stop by an Aegis Living community to discover the truth about this setting, which is specially tailored to help people with Alzheimer’s stay physically, emotionally and mentally healthy as well as maintain cognitive function. By experiencing it first-hand, you can find relief knowing that Aegis isn’t a place seniors go to finish their last days, but a place to embrace life and make the most of each day.